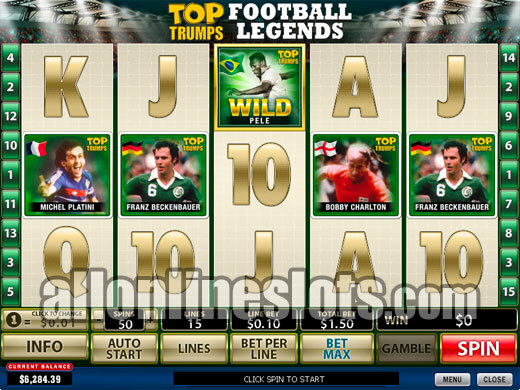 Top Trumps - Football Legends is a 15 line Playtech video slot with a football (soccer in some countries) theme. The game has a 10,000 coin top jackpot as well as free spins and a pick a box bonus stage known as the Hall of Fame Bonus. 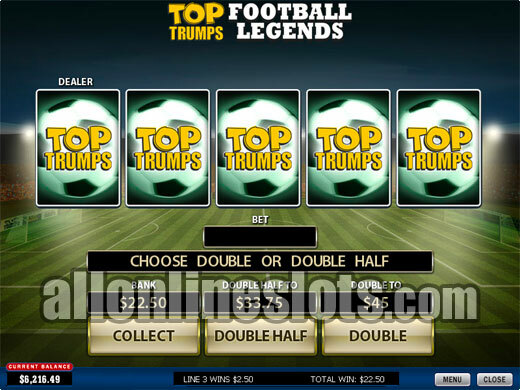 Top Trumps - Football Legends is a 15 line Playtech video slot with a football theme that pays tribute to some of the biggest names the round ball game has ever seen. The game joins a series of Top Trumps theme games that are based on the popular card games. 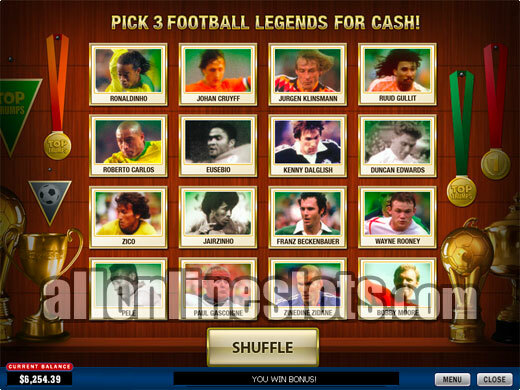 Football Legends has a 150 coin max bet and coin sizes that range between 0.01 and a big 5.00. This means you can be playing max bet for as little as 1.50 per spin or as much as 750.00 per game. Clearly the upper levels are reserved for high rollers but there are a lot of options in between the two levels. The game pays tribute to some of the biggest names in football and has the following players appearing on the reels. The greatest of all time, Pelé is wild and substitutes for all other symbols except the scatters and the bonus symbols. Getting five of the Pelé symbols on any active line pays 10,000 coins or 100,000 coins if you're playing 10 coins per line. The wilds also make up the second highest pay with four Pelé symbols (aligned left to right paying 2,000 coins. The various players then make up all of the next highest line wins with five of a kind pays of 1,000 (Johan Cryuff), 500 (Alfredo Di Stéfano), 350 (Bobby Charlton), 300 (Franz Beckenbauer) and 225 (Michel Platini). After these pays the A, K, Q, J and 10 symbols make up all of the lower wins. On the first and last reels are Wall of Fame symbols. Get both on the screen at the same time and you win a shot at the second screen stage. Its a simple pick a box bonnus where you get to pick 3 players from 16 football legends (Preview). Each pick awards an instant prize and it is possible to get an extra pick if you uncover the "Extra Pick" player. The Top Trumps logos are the scatters and are your ticket to the free games. 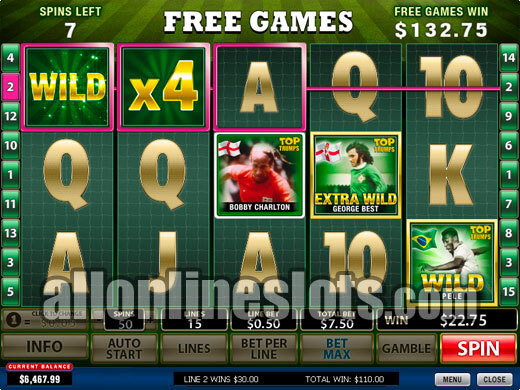 Get three or more anywhere on the screen and you win 10 free spins with an extra wild. Once activated you select your extra wild and then move to the free games. While there is no multiplier for all of the free spins any win with yoru extra wild as part of the win is multiplied by X4. 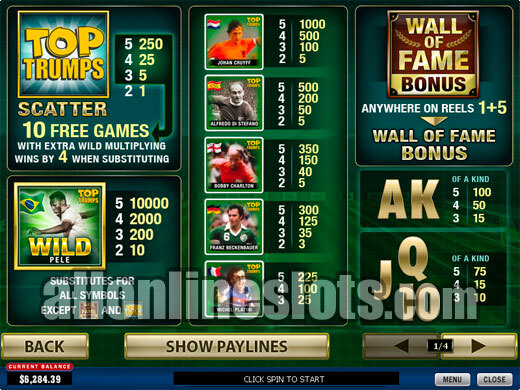 The free spins can be re-triggered an unlimited amount of times with three or more of the Top Trumps scatters. During the free games the Wall of Fame Bonus cannot be won. We would have liked to see a multiplier for all of the free spins but as you have extra wilds the chances of hitting the top pay are increased during the free games. Top Trumps - Football Legands also has a video poker style gamble feature where you have to try to pick a higher value card than the one displayed. You can shooe to bet all or just half of your win which is a nice touch. In the end, Football Legends doesnt really offer anything new but does capture the Top Trumps theme well. If you're a football fan then it is well worth checking out. If you're not a football fan then check out Top Trumps - Celebs as it's a very similar game.